Gail Pells, an educator of 44 years, may be retiring from teaching. But make no mistake– she has no plans to slow down. She has a multitude of post-retirement ambitions: reading, exercising, organizing photos, spending time with her grandson, traveling, knitting, crocheting, dancing, learning subjects, playing instruments (piano and guitar), learning new instruments (namely the Irish tin whistle), and taking lessons on her bodhran (Celtic drum). A plethora of plans lay ahead of Pells, the most imminent of the plans being a six-week National Park tour. On September 4th, when Woodland students are writing their first summer book reports, Pells will be walking into Glacier National Park. As a member of Woodland’s staff for the past 15 years, she has had a grand impact on the foundation of the school. Her legacy at Woodland ranges from the black and gold graduation balloons tied to mailboxes (a tradition Pells began, tying the balloons to mailboxes herself the first few years) to beginning the AP Language and Composition course at Woodland. 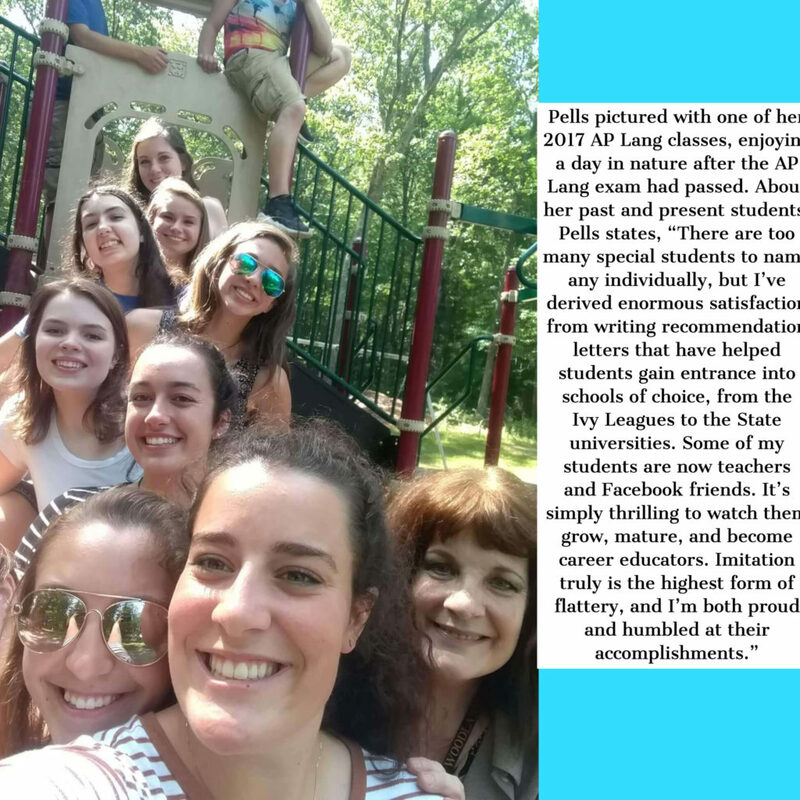 Ten years ago, Pells launched AP Language and Composition, the course she refers to as “the pinnacle of my career and joy.” Engrossed by the range of the course material, which spans from the 17th to 21st century, Pells took on the challenge of implementing “AP Lang” (as it is called among students) at Woodland. Despite being well aware of the depth of the course, Pells is continuously amazed at how truly applicable the class proves to be in the lives of students. Pupils of past and present regularly share with Pells when they see real-world applications of the rhetorical strategies covered in AP Lang, everywhere from Super Bowl commercials to Presidential debates. 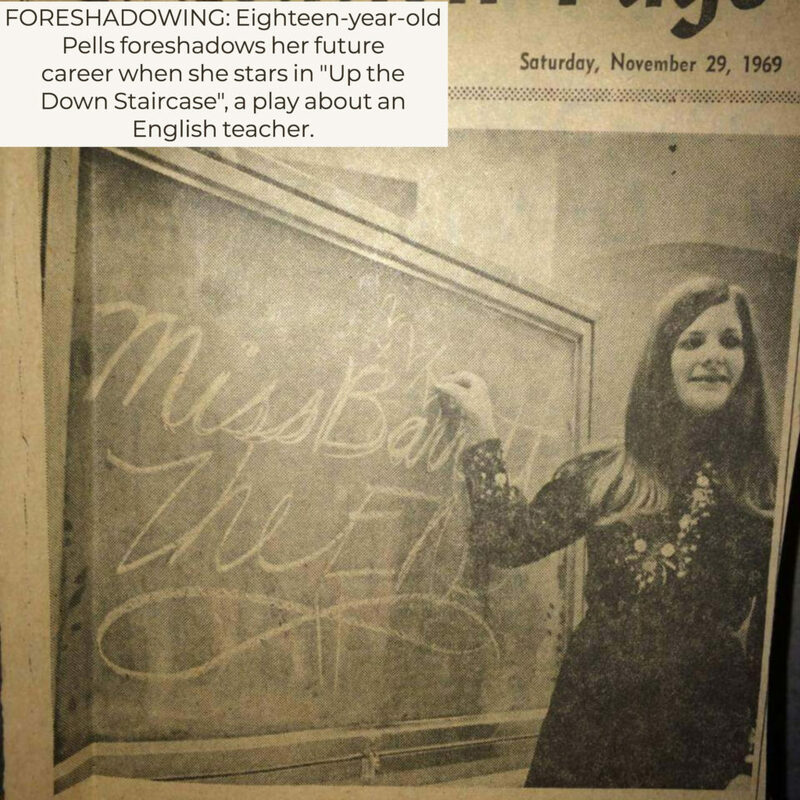 During her time at Woodland, Pells made an exceptional mark on the school; however, it is important to note her teaching journey began long before her days at Woodland. In 1974, Pells’ teaching career took off in a place far away from Beacon Falls–Fairfield West, Australia. While the environment was different, the content was fairly similar. 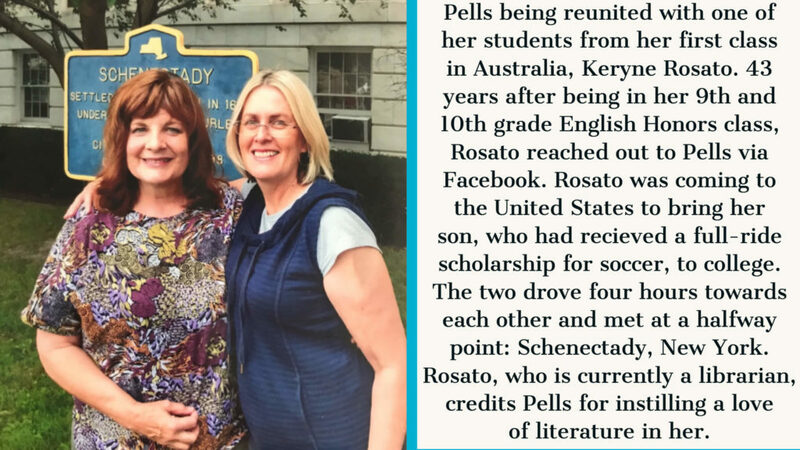 Just as she teaches Romeo and Juliet to current Woodland freshmen, Pells taught the Shakespearean play to her freshman honor students at Fairveil, the Australian high school in which she worked. The young teacher even took 33 of her freshmen honor students on a train to Sydney, Australia, for a viewing of Franco Zeffirelli’s 1968 interpretation of Romeo and Juliet. As part of their assignment, students were required to memorize a minimum of 30 lines from the tragedy, a task that would lead to a moment Pells vividly recalls 44 years later. After this moment, which Pells refers to as “the beginning of excellence”, she has continued to educate others, a profession she finds complete joy in. While Pells loves her subject matter, her true satisfaction lies in passing her knowledge onto others. She may delight in passing the torch of knowledge, but the teacher also enjoys being on the opposite end of the torch. 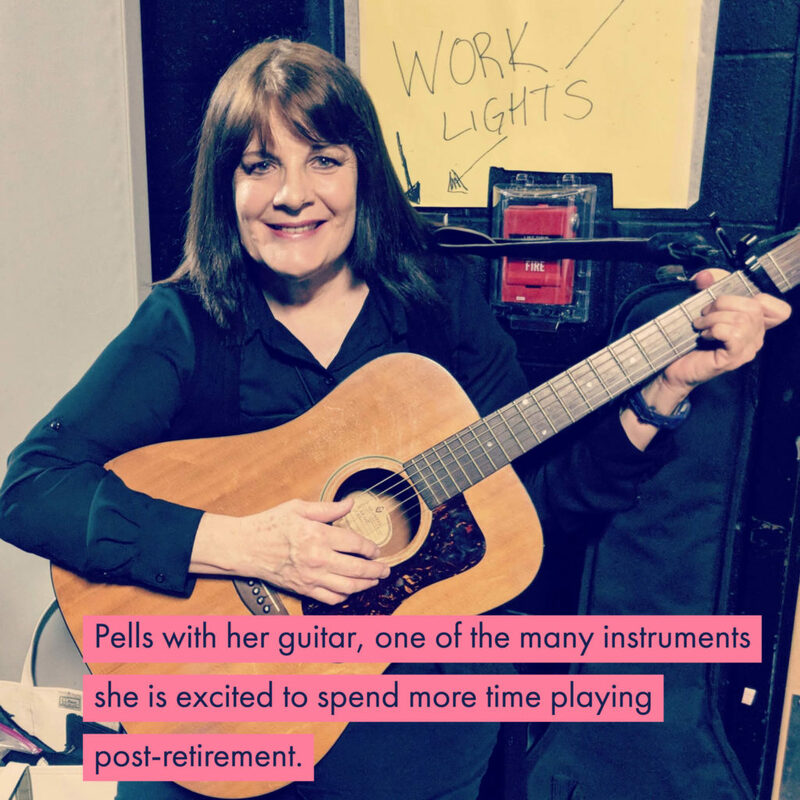 Pells, who calls herself a “lifelong learner”, intends to take courses on new subject matter after her retirement, a plan she is excited about. an appreciation and expectation that has guided her teaching style. “My philosophy is to try to reach everyone and to expect excellence from every class,” Pells elaborates. Excitement for the future is accompanied by a tinge of sadness–Pells shares she had to promise her advisory she would attend their prom and graduation in order to mitigate the shock of her departure. Her advisory is not the only group that will feel the impact of her retirement. A true fixture in the staff and the culture at Woodland, Pells will be missed by many students and faculty. However, Pells is sure to say that if students ever need a second-set of eyes on a paper or assignment, she would be happy to be that set of eyes.